- I heard that Yuen Chee Wai came to Kuala Lumpur to ask you to participate in AMF. Yes, Chee Wai saw my videos online and asked me to tour with him. I knew about Asian Meeting Festival because two of my very close friends living in Kuala Lumpur have participated in the past editions. Yong Yandsen and Kok Siew-Wai. I had seen videos of the festival and thought it was a very interesting project. When Chee Wai asked me I immediately answered "yes!" (laugh). - Can you tell me about your musical background? There is a Chinese flute called dizi and I have been playing this since I was a child. I practiced everyday for eight hours and most of my childhood was spent with this instrument. - Did you go to university to study flute? Actually I graduated from the art department at the university. I studied fine art abroad in Xian, China and spent five years focusing on ink art and Chinese paintings. Of course I was practicing the dizi during this time but also was trying to think of what I can do. Dizi is a traditional Chinese instrument so there are many rules in how to play it. To play within these rules also means that you follow Chinese traditions. So I thought that by only playing the dizi I could not arrive to anything original. My solution was to compose. Pieces that I compose I could claim that they are my original work. That is why I started to compose music. - Your composed work seems to be written with fluency in Western contemporary music. However at the same time the themes seem to be about the differences between Asian and Western music. In Asia, universities and institutions follow the Western model of teaching composition. I also studied in this environment so I was trained in Western contemporary music. At the same time I have been very interested in ethnic music and have been researching about this for a very long time. For example, I have been conducting fieldwork in Sarawak in Borneo, Malaysia where I research on their traditional music and make recordings. I also incorporate the materials that I have collected into my own compositions. I do not themetise the difference but rather my works combine aspects of both Western and Asian influences. - For example in your compositional work you have wind instruments playing extended techniques, or emphasizing the breathing sound in the flute, and other times writing in ways to bring forward the noise when playing an instrument. It seems that you are trying to find a way to feature these kinds of sounds within the context of Western music. In the context of Western music, incorporating noise or extended technique is already part of the techniques of today. Also in Asian music, for example in the shakuhachi, sound of breathing is very important. I am a big fan of the shakuhachi and have composed for it before. So in the context of Asian music noise and extended techniques are not really contemporary music elements that were recently introduced but instead part of the traditional playing techniques. Incorporating noise is found in both traditions of Western and Asian music. There are ideas about things that are unnecessary, dissonant or beautiful as is. I value the idea of beauty in things that are dissonant. - In your own performances, you use a lot of extended techniques and noise. How much of this is traditional techniques and how much of it are things you developed on your own? Most are traditional techniques, but from ethnic music. For example the shakuhachi technique that I mentioned earlier which emphasizes the sound of breath is a technique that I use when I play the dizi to produce harmonics. So actually this is a traditional technique. I try to combine techniques found in ethic music to emphasize noise with classical music techniques that emphasize harmony. - You sometimes play two flutes at a time or combine the dizi with a spring drum. Playing with two instruments at the same time is a popular technique done by many people before me like Roland Kirk. But playing one with the mouth and the other through the nose may be my own invention (laugh). I use the spring drum to change how the instrument resonates with the space that I am playing in. - At some of the concerts during this tour there were moments where you used the melody of "Charumera." Other times it sounded like you were inspired by the sounds that we heard during our sound tour in Tango with Akio Suzuki. Ah, you recognized the Charumera (laugh). I really love ramen. That aside, I think when you improvise the experience and feeling you have in the space is very important. During the sound tour with Akio Suzuki we visited rich natural environments such as very quite mountains and cliffs with strong waves. The sound of leaves blown by wind above our head when we visited the lake in the mountain was especially impressionable. It was a very quite location so we can hear the delicate sounds very well. I wanted to recreate the sounds that heard in these various locations within my concert we did in Tango after the tour. Expressing your sensibility and feeling while improvising. - Can you tell me how you started to improvise? When I was still young, I was invited to a music festival, which had many folk musicians playing. The festival organizer suggested that I play a session with them so we improvised together. I realized then, that although without a score I didn't have anything that I could call my music, I could still improvise. - So you discovered the possibility of improvising as a way to make something original? This is probably the same for traditional musicians but when you have a score or a song, you are restricted from freely improvising. I wanted to challenge this. Without a score and structure you can express your emotions and sensibility freely. I became attract to this idea and started to improvise more seriously. - How have you been improvising? I not only improvise with musicians but with artists from other genres such as dance and performing arts. I also perform in various locations that are not only concert halls but in the mountain or by the river, on the street or inside buildings. - Can you tell me more about what attracts you to improvisation? 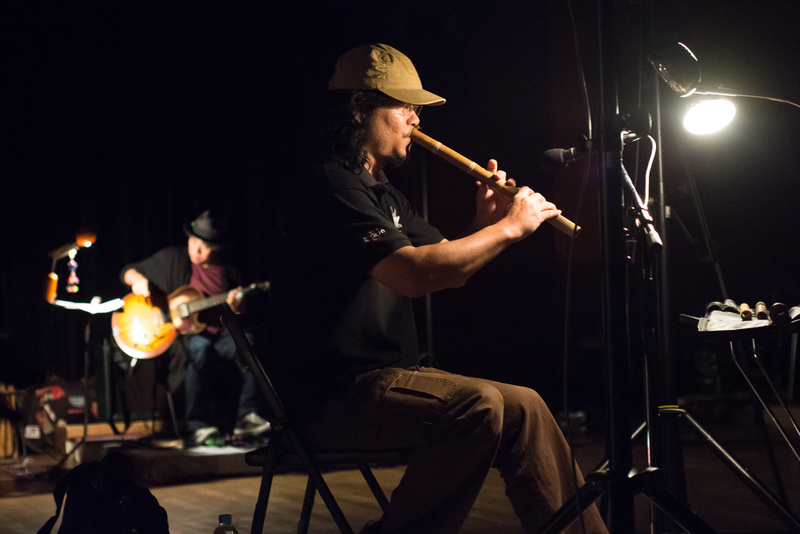 In improvisation, people from many different backgrounds can come together and make music. Just like how I played with the folk musicians, there doesn't have to be pre-decided rules. I think this is a wonderful thing. My background for improvising is classical music. The techniques I use when I compose classical music also influence my improvising. For example in classical music you decide on a motif and use that as a material to develop within the score. Of course in improvised music you don't have anything written down but I often play with the image of developing a motif or phrase without a score. So perhaps composing without writing down is how I improvise. - So to compose on the spot is improvising? Yes, it is instant composing. When I compose I usually take 3 to 6 months to complete a piece. But when I improvise I have to finish the work on that location. I have to compose with decisions made at each moment. That is why the surrounding environment becomes very important. The sound that I make here sounds like this or resonates like that - these aspects have a huge influence on how I play. How the audience is watching my performance, or what kind of musicians I am playing with is also very important. All of these are working towards the instant composition. Changing how you play according to the environment is the fun part of improvising. - There were several musicians who participated in this year's AMF who also work with the surrounding environment and there are also a growing number of Japanese musicians who think in this way too. Maybe this is a new wave of thought that is emerging. When you are improvising solo you can control how you play in response to the environment, but when you play with other musicians it may not go as expected. How do you approach improvising with other musicians? I enjoy the moments when I cannot control or that when many different things collide with each other. For example at this interview there is someone from Japanese culture, and me from Malaysian culture, and the translator perhaps from another culture. Among these many different cultures we are communicating with each other. It would be pointless if we could only communicate unless we were all from the same culture. Similarly is we are from the same culture, it is important that we are all different. If I had to become you to communicate with you or you had to become me to talk to me then there is no communication. It is very important to maintain each of our identities and that is the same when you are performing. At AMF, musicians with various instruments, playing styles, and backgrounds all come together and play. The fun part is to keep all of our differences but still play what we want. In my case, for example, if someone plays one phrase, then I try not to play the same thing. This is not because I disagree with that person but because I am trying to find my own way to make sounds. If that person persists on playing the same phrase then I would try to respond and resonate in my own way. - Is that the same even in a large group? Yes it is the same even when you are trying to communicate within a large group of people. If we had ten people in this room that would mean we have more diverse characteristics than three. Some will constantly talk, some will try to lead the conversation, and others will try to cooperate. Maybe someone is very shy but when they start talking they can't stop. Or maybe someone is very quiet and doesn't want to talk at all. This is the same when musician improvise in a group. Musicians who are quiet often are lost in the group but more mature musician may try to bring out the sound of these musicians for the audience. I often would listen to the shy musicians and try to understand what kind of sounds they want to make and change the way I play. In improvisation, music is made through each musician trying to maintain their identity, sometimes causing friction and other times resonating with each other. I think this is the most interesting part of it.